Lantana Plant There are over 150 species of lantana, from trailing groundcovers to 6-foot tall shrubs. A cousin to verbena, lantana is native to the tropics, where it grows as a perennial or shrub. Lantana foliage feels coarse and rough, with a pungent scent. Some varieties of lantana produce pretty (but poisonous!) purple berries while other sterile varieties skip the berries in favor of more blooms. There are over 150 species of lantana, from trailing groundcovers to 6-foot tall shrubs. A cousin to verbena, lantana is native to the tropics, where it grows as a perennial or shrub. Lantana can be grown in borders, mixed beds, and containers. Plant trailing varieties can also be grown in hanging baskets. In the Deep South, large varieties of lantana can be used as shrubs. 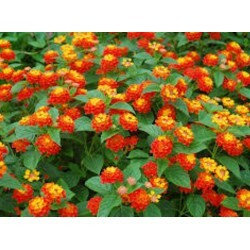 And don’t forget to add lantana to your hummingbird and butterfly gardens! · Climate: Lantana is winter hardy to about zone 8, with some varieties (such as ‘Miss Huff’) being more cold-tolerant than others. Some types of lantana diecompletely back in winter, while others keep a few stems aboveground. In colder zones, lantana is grown as an annual, or brought indoors for the winter. · Soil: Lantana does best in well draining, slightly acidic soil. Lantana is pretty tolerant of soil type, but youshould amend very heavy clay or sand with organic compost. · Light: Lantana prefers full sun. · Water: Once established, lantana is fairly drought-tolerant. An inch of water per week is ideal, but they are generally pretty adaptable. Fertilizer: Lantana doesn’t need much fertilizer; in fact, too much fertilizer can inhibit blooming. Use compost to enrich the soil, and feed in spring with a balanced organic fertilizer. Pruning: Lantana benefits from deadheading spent blooms and also from light shearing to keep the plant bushy and blooming. Give a heavy “rejuvenation” pruning in spring, down to 6”-8” tall. If your plantbecomes leggy and overgrown during the growing season, you can cut it back by a third. Powdery mildew: Watch for powdery mildew on the leaves, especially if your lantana receives some shade. Pests: Lace bugs and whiteflies are common pests of lantana. Whitefly infestation can lead to development of sooty mold. Salt: Lantana tolerates salt and makes an excellent coastal planting.